This publication is the training manual for Indiana right-of-way pesticide applicators. It covers a variety of right-of-way plants and life cycles. 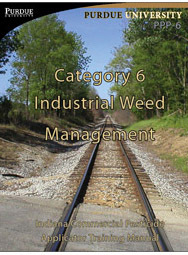 It includes information on chemicals used for right-of-way vegetation, application equipment and calibration, and public relations for right-of-way vegetation. Readers will also find review questions at the end of every chapter.